Alison shared some ideas for keeping kids entertained at restaurants while you are waiting for your food (or just waiting for the waiter). 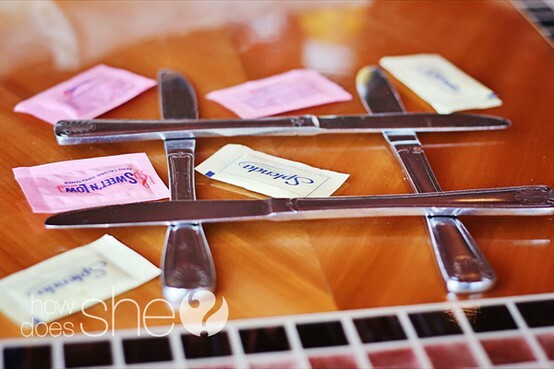 My favorite is this game of tic tac toe using sugar packets and knives. Definitely one of those "Why didn't I ever think of that?" moments. And an idea we will be using while on our two week road trip. You can check out the other ideas over at How Does She. You mean there is something to do other than feeding kids sugar packets? this is so simple. but so smart! Wow! Great ideas! I can't wait to try them the next time we're out. from a waitress, please don't do this. it's wasteful and ads something else we have to do while cleaning up your table. sugar packets aren't toys, they are for people to use. coloring books are AWESOME and i love them. please stick to stuff like that.